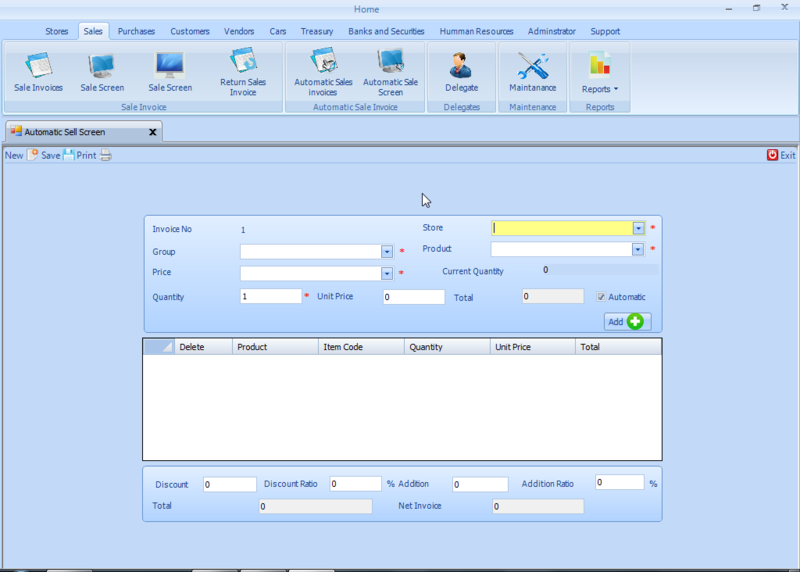 I-Sales - Sales Management System - Petra Software Ind. I-Sales gives you ease in dealing with sales and purchases of your company, factory or even your small shop,It helps you to be quick in performing required tasks, it also provides all calculations that you need during buying and selling transactions,I_sales provides recording for all items of your company and your warehouse, it also contains a full accounting system and allows knowing profits and support human resources management. Adding Customer Groups , modify , delete data. Property of adding customers , determining barcode for each customer , modify , delete data. Possibility of customers installment systems and paying it. Property of adding new vendors , modify , delete data. Property of making Reimbursements for vendors. Property of adding delegates , modify , delete data. Adding Stores , modify , delete data. Adding Units , modify , delete data. Adding main groups and subgroups for products , modify , delete data. Adding new products and its details (product picture, beginning balance), modify , delete data. Additional prices types during adding products, modify , delete data. Property of adding barcode for each product. Property of making stores permissions and movement details. Property of making conversion between stores and movement details. Adding Purchase invoices (Cash ,Debt). Adding Sales invoices (Cash ,Debt). Adding cars data , modify , delete data. Adding cars expenses types , modify , delete data . Adding cars expenses , modify , delete data. Making Journal entries for all operations in company . Property of making accounting tree. Setting of beginning balances for customers and vendors. Adding banks and branches data , modify , delete data. Adding Receivable and payable . Adding banking accounts , modify , delete data. Collecting and refusing Receivable and payable. Adding administrations ,departments , employees , modify , delete data. Possibility of recording employees attendance & departure. Possibility of recording employees absence & vacations. Determining discount and overtime ratio. Determining overtime for each employee. Determining receiving assets for employees . Determining warnings given for employees. Determining employees Incentives and sanctions. Recording salaries and advances for employees . Report of products data and print it. Report of Below the limit demand products and print it. Report of stock in stores and print it. Report of delegates invoices and print it. Report of sales invoices and print it. Report of products sales and print it. Report of more sell products and another for less sell products and print it. Report of more profit products and print it. Report of stagnant products and print it. Report of daily sales and print it. Report of purchases invoices and print it. Report of products purchases and print it. Report of total purchases and sales and print it. Report according to any certain invoice and also with its number number and print it. Report of customers & vendors data and print it. Report of customers & vendors accounts and print it. Report of customers installment systems and print it. Report of stagnant customers & vendors and print it. Report of more movement customers & vendors and print it. Report of customers & vendors movement and print it. Report of car expenses and print it. Report of journal entries and print it. Report of trial balance and print it. Report of income statement and print it. Report of balance sheet and print it. Report of general ledger and print it. Report of receivable and payable and print it. Report of banking accounts and print it. Report of employees attendance & departure and print it. Report of employees overtime & vacations and print it. Report of employees salaries and print it.